In October 2013, I stood less than 500 meters below the Khumbu Ice Fall, where 16 Nepali Sherpas perished on April 19th 2014, buried in an avalanche of enormous chunks ice tumbling down the mountain. Back then, I was one of 14 Irish walkers on a 12 day trek to Everest Base Camp. The flight from Kathmandu to Lukla was thrilling or scary, depending on how you felt about zig zaging through a maze of breathtaking mountain peaks, and landing suddenly on very short upward sloping runaway. The applause that greeted the bumpy, hard braking landing signalled both my relief and anticipation. Lukla was the starting point of our trek, and I was captivated by the notion that we would be walking the same 60 kilometres trail as Hillary and Tenzing hiked in 1953. We were warmly welcomed at the eight villages along the way, by busy hardworking communities, heavily reliant on tourism, and where every scrap of arable land is planted. Porters, Yaks, and Sherpas are essential supports for trekkers and mountaineers who visit Nepal. There are no roads between Lukla and Base Camp, just steep rocky tracks, not suitable for vehicles of any kind. Everything has to be transported up and down the valleys between villages, by porters or yaks. The quiet carillon of yak bells, heralding the arrival of those shaggy, sure footed, lumbering beasts of burden, was a sound we would become familiar with over the coming days. On the first day the mountains and valleys were rich with green forests, flowering plants, and bird life, since we were not yet in the Alpine region of snow and ice. 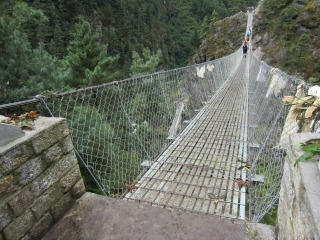 We traversed several very long, high, narrow, and swaying steel suspension bridges. The noisy rushing torrent of icy boulder filled rivers, hundreds of feet below those wobbly bridges, made these crossings an unexpected challenge. Day 2 involved a precipitous 900m climb to 3500m. Already some of our team were experiencing the effects of altitude... headache, loss of appetite, nausea, difficulty sleeping, and dizziness. I felt ok, apart from occasional laboured breathing, my thinking seemed slower than usual, and I had some anxiety about what lay ahead. We had a ‘rest day’ in Namche Bazaar Village to recover from the gruelling previous day’s trek, and to help us acclimatise to the altitude. Namche is the main trading centre and tourist hub for the Khumbu region, and is a major stop-off point for trekkers and climbers heading for Mount Everest base camp. We climbed over 400m hoping to get our first glimpse of Everest, but heavy rain and poor visibility meant that special moment had to wait another day. We descended again to sleep at the lower altitude. For dinner most evenings we ate dal bhat tarkari, the staple Nepali trekking food of lentil soup, steamed rice, and vegetable curry. We loaded up on carbohydrates, and drank litres of water, to replace the estimated 6000 calories we were burning each day. Clear skies and warm sunshine made the next day the most pleasant of the trek so far. As we left Namche, heading into the more remote high Himalayas, I sensed that our adventure was about to get more challenging, and my fitness and stamina tested. Buddhism is widely practised in this part of Nepal, as was evident from the carved stone tablets called Mani stones, inscribed with mantras, spinning prayer wheels, prayer flags fluttering in the wind that greeted us in every village. We climbed 600m to visit the remote Tengboche Monastery to hear the sonorous chanting of the monks, and seek their blessing for a safe journey. Next day we trekked a steep rocky trail to Pheriche, looking out for ‘traffic jams’ caused by yak caravans. Yaks are placid animals; the only risk is that they might accidently nudge you off a narrow path, down hundreds of feet! Trekkers have been killed or injured in this way. Day six was another ‘rest day’, which, contrary to what those words suggest, turned out to be the hardest and most rewarding day I ever spent on a mountain. We ascended over 800 metres to an altitude of 5100m, our highest point to date, and yet we were dwarfed by towering snow capped peaks. Nepal has eight of the ten highest mountains on earth, including Ama Dablam at 6800m, one of the most beautiful peaks in the Himalayas. We descended to 4300m, and I slept well that night. The daily challenges were relentless and varied, with my mood shifting from exhilaration to doubt and weariness. On day seven we had a strenuous scramble up the rocky slopes of the Khumbu glacier. It was poignant to see rows of stone memorials, honouring the brave men and women who died on Everest. We slept in Tea Houses, and before retiring we huddled for warmth around a stove made from an old oil drum, fuelled by wood and yak dung. We were buoyed by the thought that next day, all going well, we would be standing at the foot of the world’s best recognized mountain, a mountain to which mountaineers have been drawn like no other. However, headaches, the Khumbu cough from the dry thin air and dust, and shortness of breath, cautioned us that this goal was not guaranteed. One of our team, who had laboured so bravely to get this far, had to be helicoptered back to Kathmandu, due to severe backache, and for the first time this created doubt in my mind that all of us would make it. 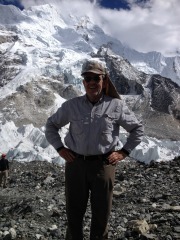 The final day’s trek to Base camp was a very long taxing passage, somewhat alleviated by beautiful warm sunshine. We had left behind the remaining traces of Nepal’s rich biodiversity, and it was difficult to scramble on a grey slippery jumble of rubble, sediment, rocks and boulders, that had been bulldozed down the valley by the Khumbu Glacier. The trail, barely recognisable in places, went up and down flanking the glacier, until eventually we dropped down and crossed the glacier itself. Base Camp (5364) rests on the immense Khumbu Glacier, comprised of rocks and ice. The glacier, about 12 km long and 1km wide in places, is debris strewn from avalanches, rock falls, and melting. I stood in silence gazing at the beautiful disorder wrought by the forces of nature over thousands of years. The Mountain, which the Tibetans call Chomolunga, Goddess mother of the world, evokes images of mystery, beauty, danger and triumph. The massive natural sculpting of the landscape with the treacherous Khumbu ice fall-huge towers of ice, resting precariously on a moving glacier, just above base camp. I gazed spellbound at the signature plume of windswept snow and ice streaming off the 29000 foot summit. I marvelled at the spectacular scenery of the Himalayas, the white snow, black rocks, and blue glittering ice as hard as diamonds. I said a quiet prayer of thanks, for one of life’s precious experiences. I’ve been asked the question ‘Why did I do it’? I could say I did it for the adventure and the challenge, and to answer the question, ‘would I be good enough’. I also went for the stunning scenery, the Nepalese culture, and to fulfil a fifteen year old dream of standing at the foot of the world’s most famous mountain. Above all, I did it for the sheer joy of it! Pat Falvey, one of Ireland’s great modern adventurers, led the trek to Everest Base Camp. Have you a story about Senior Trekking Nepal, or other Senior Adventure Travel? I would love to hear about it. Your Story is unique, since no one has seen the world through your eyes.